Search for survivors in the Shattered Shoals. Shattered Shoals — Explore the site of the Aldmeri Dominion shipwreck. 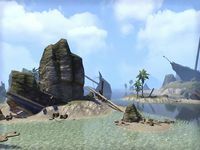 The shoreline of Shattered Shoals is lined with the shattered hulls of Aldmeri Dominion sailing vessels. Equipment and personnel are scattered along the beach. Collect Torchbug Treacle to treat the wounded. Report back to Sergeant Firion. Talk to Captain Jimila, and then Mastengwe. "You there! Have you seen my squad?" 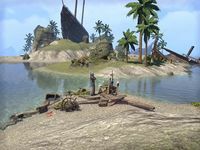 We were on the Little Alkosh, part of the Dominion fleet sailing for Khenarthi's Roost. Then a hurricane blew up out of nowhere. Sails tore, hulls cracked, and we were thrown into the ocean. I ended up here, but can't find the rest of my squad." Did they survive the hurricane? "I thought I heard one of them calling out, but the ocean twists up sounds. If they're wounded or pinned down …. Could you keep an eye out for my soldiers? They answer to Edhelas, Onglorn, and Nistel. Two of us can cover more ground." "I'm sure my squad made it to shore alive. Dominion marines constantly defy the sea's attempts to drown us, but hurricanes are another matter. I fear my squad is banged up worse than I am." What can I do about their wounds? 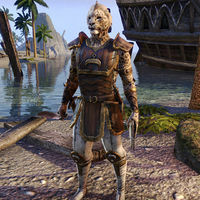 "Our ship's hold was packed full of an old Bosmer healing remedy. The labels say Torchbug Treacle, but marines call it glow juice. The wreck scattered bottles across the beach, must be what brought out the alits." Alits? What do you mean? Squat creatures made of teeth, claws, and endless hunger. I've heard their cries up and down the beach since I came to. Their sweet-tooth is bigger than their walnut brains. I saw one of the stupid thing swallow a whole bottle of glow juice. If I see any, I'll bring torchbug treacle to your squad. Good luck. Do me a favor? If you find them before I do, tell them the ocean hasn't killed me yet. Find the three members of Firion's squad, Edhelas, Onglorn and Nistel, scattered across the beach, the order is of no importance. 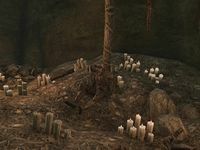 To collect Torchbug Treacle, the bottles can be found sitting on the ground near broken crates or you collect them from killing the local alits. There are future consequences depending on whether you give the injured squad members the treacle or not. Additionally, there is currently a bug related to their dialogues, see below. You find Edhelas at the shore sitting between some rocks in front of a shipwreck. "Who are you? Were you part of the fleet?" Sergeant Firion sent me to find you. Waves smashed me against the ship. Cracked a few ribs. Not the best feeling." Tastes like sandals boiled in mint perfume. But if it knits my ribs, I'll drink the whole bottle." Sergeant Firion expects you. You need to go, now. "I can manage. Talking makes me cough up blood. So I'll quit jabbering." I'll look for the rest of your squad. Sergeant Firion saw bottles of torchbug treacle on the beach. I'll go find some for you. Ends conversation, once you return with some torchbug treacle, he'll say, "Glow juice? You find some?" Good. I'll find Sergeant Firion. Go. Get them back safe. "Lieutenant Gelin pulled me ashore. Went to find shelter. Never came back. Headed to a nearby cave. Find him. Tell him we're safe." Nistel is sitting behind a mast at another stranded ship wreck, a bit northwest from Edhelas. "'I lost a lot of friends in that storm. Give me some good news.'" "I saw her swept overboard in that damned storm. Held onto the rigging long as I could, but it tore the skin off my palms. If I can't hold a weapon, I'm useless to my squad. Do you have any bandages? I lost my kit to the sea." This torchbug treacle might help. "Glow juice? Used to think this stuff was only good for practical jokes on snowy days. Once I can heft Spleen-shanker, I'll push through the beach and find Sergeant Firion. How about you?" However, if you don't have any Torchbug Treacle with you, you can either offer to find her some or make her leave anyway. There's no time. Sergeant Firion expects you immediately. "I can manage. I wasn't holding the rope with my feet. What about you? What's your plan?" Sergeant Firion said torchbug treacle might help. I'll look for some on the beach. Ends conversation. After returning to her, she'll say, "Did you find any glow juice? I got some sand in my wounds. Don't ever do that, even by mistake." I told Sergeant Firion I'd find the rest of your squad. "Hope they appreciate their good fortune when you find them. I can get inland, after I rest. Fight with purpose." I found everyone in your squad. "You should let Lieutenant Gelin know. He spit in fate's eye when he pulled me from the water. Said he saw a cave nearby and was going to look for shelter." Onglorn can be found sitting between some wooden beams at a large rock, a bit northwest from Nistel. "Bless Y'ffre, I'm glad you came by! Have you seen any other marines along the beach?" "She's alive? I suppose that's some luck amidst all this wreckage. Can't say the same for my leg. If I don't put too much weight on it I can manage a good hobble." Sergeant Firion said this torchbug treacle would help. "Glow juice? By the gods, it just might! Soon as I can stand on my own, I'll head inland." Push through the pain. Sergeant Firion needs you right away. "The gods give us pain to test us. Or amuse themselves. Either way, I'll deal with it." Sergeant Firion said there was torchbug treacle on the beach. I'll find some for you. Ends conversation, once you return with some torchbug treacle, he'll say, "Praise the gods, you're back! I thought you were an alit." No matter if you gave him Torchbug Treacle or not, the conversation will continue the same way. I need to find the rest of your squad. "Blessings upon you, stranger. I'll limp my way inland and find a safer place to wait for Sergeant Firion. Just knowing she's out there gives me hope for the rest." "Lieutenant Gelin dragged me out of the water. He'll want to know Sergeant Firion and the rest of the squad are all right. Think he said something about looking for shelter in a nearby cave, but I was still coughing up sand." The last marine you find will request that you search for Lieutenant Gelin, who went into a nearby cave and never came back. Head further northwest along the shore until you see a cave entrance below a temple, the Temple of the Dark Moon. Enter the cave, which is filled with piles of bones and snakes, including one of the giant variety. Gelin is in the back of the cave, tied to a post … and very much dead. Examine his body to see what you can find. When you leave the cave, you will find that Sergeant Firion and her squad have reunited and are waiting for you outside. Talk to Firion to report Gelin's death and your initial findings. "Turns out my squad were the ones who found me. Ever consider a career as a Dominion marine? You'd make quite the scout. My squad said you were looking for Lieutenant Gelin. Have you found him?" I found his body in the cave. Someone killed him. It looked like he was killed in some kind of ritual. "First a hurricane blows out of nowhere and destroys our fleet. Then an able-bodied Dominion marine is captured and tortured to death? What else was in that cave?" Lots of bones, candles, and snakes. Also, wooden posts. "Some kind of sacrifice? This is too big for my squad to handle. We need reinforcements. Nistel spotted a beached ship nearby. It looks intact, and she spotted Dominion sailors aboard." "We need to combine our forces and find who murdered Lieutenant Gelin. My squad and I need to pull his body out of that damned cave. Would you warn the sailors on that beached ship? They need to know it's not safe to wander around." "Wait, take this. I found some glow juice while I was looking for my squad, but they're on the mend. You'll get used to the taste. We'll be along shortly. Watch yourself." You will then receive 3 Torchbug Treacle potions. They can provide both healing and major fortitude. 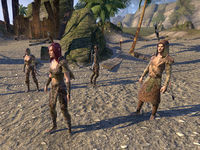 These are always level 1-9, even if you are doing this quest at a higher level, so they are not very helpful if you are not doing this quest at level 1-9. since One Tamriel, have these scaled up?. '"'Good. The squad's wounds are slowing them down, but we'll be along shortly." "You aren't a slik-arsed Sea Viper or a cabbage-mouthed castaway. State your business with the crew of the Prowler." A Dominion marine was killed in a nearby cave. "The hurricane killed hundreds of marines. Why does it matter if one of them died in a cave?" He was murdered in some kind of ritual. His squad needs reinforcements. "Oh. Well, the Prowler is like a hen in a wolf den until she's seaworthy again. Maybe your marines can prove they're more than two-legged cargo in shiny armor. If they pitch in, I'll consider reinforcements. They up for it, or are they all talk?" Some are injured, but I'm sure they'll help where they can. Stubbed their toes, eh? Never understand why they fight in sandals. Until the leaks are patched, our hold will take on water. Oh, and our helmsman's wheel cracked in the storm. Locate a replacement in the wreckage and I'll have a sailor pick it up. I'm sure they'll help where they can. "And I'm sure they'll be as useful as they were in the hurricane. Should they care to prove otherwise, they're welcome to do actual work patching leaks in the Prowler's hold. Maybe they can locate a replacement helmsman's wheel in all this wreckage." I'll see if they can find the helmsman's wheel and patch the ship. It must have fallen overboard when we beached. Our lookout saw those skink-fingered pirates make off with it. You'll have to get the sun-sighter back, any way you can." You have the option of asking Oblan about the Sea Vipers, the sun-sighter and the Prowler itself. Find a replacement Helmsman's Wheel. Coincidentally, Sergeant Firion and her squad have arrived. You have the option of talking with Sergeant Firion for assistance. This is the other point of the quest where taking the time to collect the torchbug treacle to heal the injured marines pays off. Certain squad members have the skills which can delegate to them. However, if that squad member is not healed you will have to have to complete the task yourself. "These aren't Dominion sailors, they're privateers. Just our luck." Quartermaster Oblan promised reinforcements when the Prowler is repaired. "We'll show that old sea-cat what Dominion marines can do." The Prowler needs a replacement helmsman's wheel. "Edhelas is the best scrounger in the regiment. If you want, I can send him out to look for a helmsman's wheel." All right. Send Edhelas to find a replacement. "He's on his way. Anything else we can do?" I'll find the helmsman's wheel myself. "Suit yourself. Anything else we can do?" There are leaks on the Prowler that need patching. "Nistel is as good with a mallet as she is with her sword. I can have her patch the Prowler's leaks." Yes, have Nistel patch the leaks. "She'll have those leaks fixed in no time. What else?" No, I'll fix the leaks myself. The Sea Vipers stole the Prowler's sun-sighter. "Onglorn is our best tracker. He can recover the sun-sighter in no time." Sure, send Onglorn to recover the sun-sighter. "I almost pity the Sea Viper who's holding onto the sun-sighter. Onglorn will recover it soon enough. What else needs doing?" No, I'll look for the sun-sighter myself. "Have it your way. What else needs doing?" I can handle the rest myself. "All right. I appreciate what you've done for us. We'll keep the Prowler safe while you take care of the rest." "Then it's time for that mangy privateer to make good on his promise. Maybe you should do the talking. I'd just rub it in." As you choose a squad member, they will run off. However if no one on the squad was treated with Torchbug Treacle, they will stay behind to defend the ship. "We're a little banged up, but we can still defend a beached ship from pirates. We'll show that old cat what Dominion marines are made of." If you have to or have chosen to complete the repairs yourself, they are as follows. The leaks are in the hold of the ship, accessible from either side of the deck. You can use Prowler Patches to help repair the holes. They are obtained from (? )[verification needed — need to know where these obtained?]. The Sun-Sighter may be found randomly on one of the Sea Vipers to the west and north of the Prowler. "That was fast. All right, there's room on the Prowler for your marine friends, as long as they work for their meals." "I said I'd consider it. Captain Jimila is the only one who can make that call." Then what does your captain say? "Something you'll want to hear. You just made the Prowler seaworthy, and Captain Jimila always pays her debts. Go, talk to her. She only bites if you give her good reason." The captain is on the forecastle of the ship, surveying the area. She will be happy with your efforts and reveals that some her people have also been taken by the Sea Vipers. "Due to your efforts, the Prowler is free to sail once the tide comes in. Those marines did their part as well. I have no reinforcements, but I offer something better. I know who's killing the Dominion soldiers. And I know how to stop it." "Our lookout watched the Sea Vipers drag a Dominion marine into a cave. Later, he saw your friends remove the marine's body. If we weren't so short-handed I'd have ordered his rescue, but three of my own crew were missing." What happened to your crew? "Before we understood the danger, I sent my crew to scavenge among the shoals so we might repair the Prowler. We thought they'd disappeared, but one just returned—and she tells a harrowing tale." "The Sea Vipers happened. Now there's a new storm brewing, and I fear they're the cause of it. Mastengwe recovers below. Hear what she has to say for yourself." "The Sea Vipers are insane! They're trying to create another hurricane!" Another hurricane? What do you mean? "Suhr, Virkvild, and I were scavenging for a replacement helmsman's wheel when the Sea Vipers ambushed us. They brought us to the island with the beached Dominion flagship. They'd done things there, terrible things." What have the Sea Vipers done? "Those filthy Maormer dragged my mates up and tied them to these serpent-shaped statues. Then they started chanting, and lightning surrounded them! That's when the storm began to form around the island." The Sea Vipers created the storm? "Yes, I'm sure of it. It was a terrible sight. The Sea Vipers were so caught up in the ritual, I slipped free. I tried to grab Suhr, but the lightning held him fast. Then one of the Sea Vipers yanked at him. I saw the Maormer's wrist glow." Why would the Sea Viper's wrist glow? "The Maormer wore lodestones on their wrists. It let them ignore those lightning bonds. But I couldn't find any more, so I jumped off the ship and swam for it. Please, don't let them sacrifice my crewmates!" In order to get Suhr and Virkvild back, you'll need a Lodestone too, these can drop from any slain Sea Viper. Once you have one, then head northwest of the Prowler into the eye of the gathering storm. You'll pass by a skyshard on the way and may encounter more Sea Vipers. Aboard the beached Dread Halycon, the two ritual sacrifices can be found on either end of the ship. However, Jyklos—the mage leading the ritual may be found on the deck in the eye of the hurricane. He can provide provide a tough fight at beginner levels, but due to his respawn timer, it is possible that you will not encounter him. Suhr is found at the prow side of the ship, using the lodestone will release him from his magical bonds. Once free he will run back to the Prowler. Suhr: "Those Sea Vipers are insane!" Virkvild is up the stairs from Jyklos, near the stern. 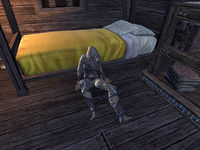 When he is freed using the lodestone, he will shout in defiance before running off. Virkvild: ""They won't kill me today!" Once both are freed, the ritual will stop and the storm will abruptly cease. You can then return to the captain with the news. However, before you leave you can also go below deck and read the Maormer poem Sky and Storm. 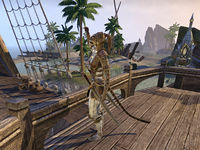 Captain Jimilia will pleased with what you have accomplished and even offers the bosmer marines a place aboard. "Suhr and Virkvild returned just after the skies cleared up. They're a bit damp, but otherwise all right. My lookout says I have you to thank." Yes. I stopped the ritual and freed your crewmen. "Then we'll finish repairs and shove off at high tide. Oh, your marine friends fended off Sea Vipers while you rescued my crew. They're welcome aboard as long as they want. Perhaps we'll see you at Mistral. You'll always have a place on the Prowler." You will then receive some gold and the Broadhead Shield as a reward. 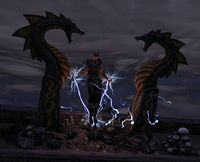 If you are also investigating for Commander Karinith and Razum-dar you will learn Sea Vipers Can Create Storms with Ritual Magic. When rescuing the three marines, if you talk to one of them without having any torchbug treacle and then use the dialogue option to tell them you will gather some, get it, return and give it to him, the task will not be closed in the journal and you will not be able to finish that stage of the quest. ? Either have torchbug treacle with you before you talk to each marine or send them off without giving any torchbug treacle to them, but do not use the dialogue option. If you have already done so, drop the quest and start it anew. Sergeant Firion was wounded in the shipwreck. She asked me to help find members of her squad. She believes they may be wounded and encouraged me to keep an eye out for torchbug treacle, which can be used to treat injuries. I located Sergeant Firion's squad-mates. One of them saw Lieutenant Gelin, who went searching for a cave to provide shelter. I should find the cave and inform him the squad is safe. I found a cave near Sergeant Firion's wounded squad-mates. I should see if I can find Lieutenant Gelin within. I found Lieutenant Gelin dead within the cave. His body bore signs of a ritual killing by unknown assailants. I should find Sergeant Firion and inform her. While Sergeant Firion and her squad deal with Lieutenant Gelin's body, I should warn some nearby Dominion sailors to keep alert. They're by the only intact ship on the beach. One ship survived the shipwreck. I spotted someone nearby who looks like he's in charge. I should warn him of Lieutenant Gelin's ritual killing. Quartermaster Oblan says he'll help Sergeant Firion and her squad once the privateer ship Prowler is fixed. They aren't in the best shape, so I should help move things along. The Prowler is seaworthy again. I should speak with Quartermaster Oblan about reinforcements for Sergeant Firion. Quartermaster Oblan said Captain Jimila would speak with me about reinforcements for the marines. I can find her on the Prowler's forecastle. Captain Jimila told me one of her sailors escaped from Sea Vipers performing some form of ritual magic. She suspects they were the ones who murdered Lieutenant Gelin. I should speak with Mastengwe, the sailor. 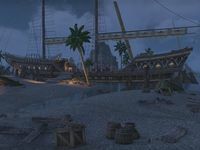 Mastengwe said the captured Prowler sailors were being used as sacrifices in some form of Sea Viper weather ritual on Viper Island. I will need a lodestone to free them and stop the ritual. I captured a lodestone from the Sea Vipers and reached Viper Island. The beached Dominion ship nearby seems to be the source of the Sea Viper ritual. Objective Hint: I should free the captured Prowler sailors to disrupt the ritual. Finishes quest I stopped the Sea Vipers' weather ritual. I should return to the Prowler and inform Captain Jimila. This page was last modified on 22 February 2019, at 06:51.